This 1 inch button badge is for all the Princesses celebrating their Birthday during the month of November. 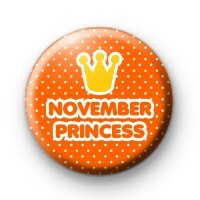 This is a fun bright orange badge with a yellow crown & the text November Princess. All you need on your birthday is a badge & lots of cake!